I have an entirely new Web Design in the works for the website, and with it, new 3D Models, and even some proto-type architectural designs of homes and commercial buildings. It has been on hold for 3 years due to many real life things. One being work, another being that I'm just not into Startrek much anymore. Another is a change from using trueSpace to 3DS Max for 3D work. And now, I have learned Max, and have imported all the Starfleet Missions 'sets'. I have also been remaking most of the models that needed it--I will first work on the SFM Episode 1. It will have added scenes as well, as well as music and more, using Windows Media Video. Production is underway, and I have turnaround on making shots is so much faster, so it will be completed much faster. Making Models for Neverwinter Nights almost done! After a year in development, the hakpak for the RPG Neverwinter Nights will be released in a few weeks, and then, All the 3D Models here (sci-fi) and such will finally get a total remake, and I NO LONGER use trueSpace3D. I have moved to 3D Studio Max. 3DS Max is a sophisticated high-end 3D Modeling software package that has been used in MANY Hollywood blockbuster movies, and animated movies like Toy Story. Hurricane Images of our area! I live in Florida, and as many of you may know, we were hit with 4 hurricanes this summer, and 3 of them hit over our city, Lakeland. Our home lost only 2 shingles and mostly tree branches (some LARGE though). I have put up an image gallery Here so you can see what the last one did -- Hurricane Jeanne. It was a scary storm, and I like storms, but this one was scary. 90+ mph sustained winds is no joke. 4 of our neighbors lost 50% of their roofs and siding, so we were very lucky. View the images here! AND IT'S DIRTIER THAN EVER! It's the same one just released below, but the quality is 200% better, and new scenes have been added and reshot. It's now 14MB. Let me know what you think on our Forum! You can watch it Here. More on the way! Over the past five Months, we have been working on the remake of the first Starfleet Missions movie. Originally released in 1994, the graphics are very out-dated. We are working for a release date of July 2004. The original was done in Deluxe Paint Animation, and the remake will be done in trueSpace 6.5 with full music score, and voice and sound effects. What about Starfleet Missions II you ask? well, production on that was halted until this is released, and it is mostly complete, and we will need people to do voice-overs, so if you have a good speaking voice, and can maybe do more than one voice, Email me with a sample! The Official Forums are BACK! It's been some time since our Forums have been up, but I have created a brand new 'TGEWEB' Forum for anyone to post your artwork pic's as well as see upcoming artwork from the many projects I am working on! The forums are located at Ironworks Forum--Which is another Site I own and have been running since 1999. Everyone is welcome!!! Click Here to go right to the Art Forum. World Premiere of Durty Bug™! The Great Escape has released the first ever totally digitally produced Comic based on the Characters Dan Huling created back in 1982. The Comic is entitled 'Durty Bug™' (Not Dirty Bug), and you will be able to read the entire Comic, which is 35 pages. For those what will want a paper based comic, those will also be available, and will be autographed on request. We're setting up the Shopping cart for purchases now! Our first Official Compu-Comic Release will be in June 2003! 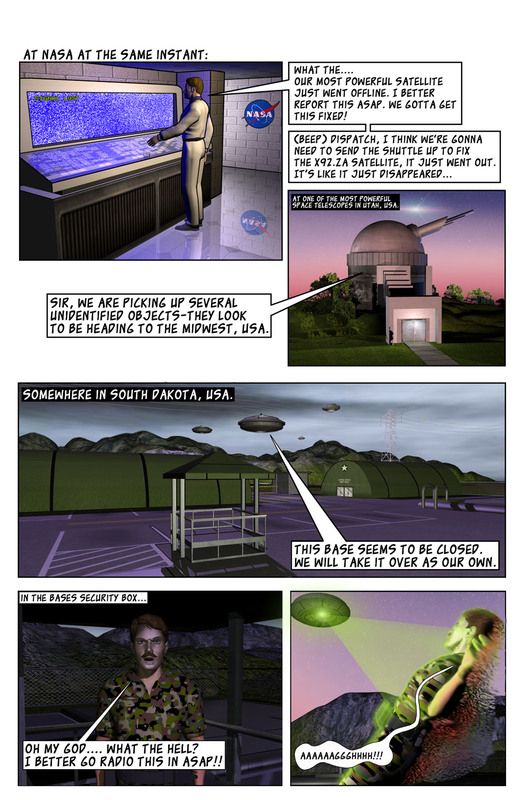 This comic is based loosely on the TV Series "War of the Worlds" --Not to be confused with the Movie of the same name. We will also be selling them in paper format for a small price, but the digital format is free. Each comic's locations, people and 'sets' were all done in trueSpace5 (a 3D Modeling Program) and with added effects which look amazing! Click Here to see a page from the 1st Issue we will be releasing in Jan 2003. I have had many emails asking when SFME2 would be released, since I started the project in 1999. Since then, many things have happened in my life--My Mom passed, and we had to deal with a few other things as well. Needless to say, I am still working on it, and it's about 50% complete. I already have the soundtrack ready, so that will help speed the release a lot! Stay tuned for a short clip of SFME2 early next year! I have been very busy with many different projects for a few months, and will be releasing 2 NEW Models soon. One is the the Transport Rings from Stargate SG1, and another is The SS Enterprise NX-1 (As seen in the new Startrek series 'Enterprise'). It looks much like the Akira Class Starship. Also-- I have been reworking the forums. I have upgraded the forum software, and right now I am testing it out, and working on the artwork layouts for it. It will be ready for use in a week or so. The first in a series of 30 second 'previews' of the sets that are used in Starfleet Missions II are being uploaded, the 1st one is online now! This AVI REQUIRES the Div-X Codec, which can be downloaded Here. Have you Downloaded My Animated Star trek Movie yet? If not, go Snag it ASAP, If you are into Star trek, you will really Enjoy it! This Movie, Starfleet Missions Episode I, was Made in 1994, and was 100% Drawn and Animated by Hand. Its 8.5MB, and Runs 15 Minutes long, you don't need any special viewer to see it either, I have integrated a player into the program. Starfleet Missions Episode II has been in Production for over 2 Years now, and its going to be one Huge Movie and will be free to download when its done! I have thrown away the Old Site, and created a totally Brand New Site for this Movie, Its Release will be Pretty soon, and on the Episode II site, you can View all the Latest Screen-Shots, a Behind the Scenes look at the Movie In Production, plus, Read their Bio, and View each Cast Member Rendered Entirely in 3D! This Movie is a 500% Step up from the First Episode made in 1994, the Entire movie will be Fully 3D, will have a Soundtrack, and Voiceovers! What are you waiting for, Go Check it out! Be apart of the trueSpace Webring, its simple to join, and will increase your traffic to your site. If you play Baldur's Gate I or II, Darkstone, Wizardry 8, Icewind Dale, Sacred, Neverwinter Nights or any other number of great CRPG games, check us out, we have all the latest and greatest news and info on all the top RPG games. Ironworks Forum covers RPG games, as well as General Discussions--not having to do with gaming at all. We also have a current events forum, and the 3D Modeling and Drawing Forum! Check it out, and tell your friends! Upload your Artwork, and show it off! I have designed many Starships and for the Starfleet Missions II Movie Coming soon. I have added a handful of the Best Starships already, and I will be adding more and more until I have ALL Ships covered, this also includes Space Stations. Those great 1980's Transforming robots are back, and I posted some old scanned in comics that I have designed when I was younger.. They have been cleaned up and digitally enhanced as well! © 2019 The Great Escape Studios All Rights Reserved.